This week's featured teacher is Pam from Mrs. P.'s Specialties. What grade levels have you taught? I am an elementary special education teacher. I have taught K through 8th grade. What is your favourite part about teaching? My favorite part of being a teacher is helping kids have more "A-ha!" moments. Nothing better than when a student who has been struggling to understand something finally gets it. The look on the face is what keeps me going! What is your best advice for a beginning teacher? 2. Over plan - plan more than you think you will get through, so when something ends early, you are prepared. 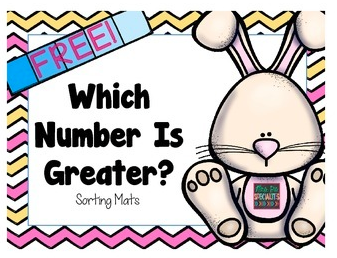 Pam would like to share a low prep math center freebie from her Mrs. P's Specialties store on TpT. You can download the file by clicking on the picture below. If you download the freebie, don't forget to leave Pam some feedback for her generosity. You can do this by clicking on My Purchases and finding the download in your "Free Downloads" tab. Don't forget to check out Pam's blog for lots of great teaching tidbits! Her latest post talks about using stickers to teach math in early primary. Thanks, Pam, for participating in my Teacher Feature! Looking for more great math games? Have a great math game to share? Thanks for adding your games to the linky! Thanks for highlighting my blog and freebie! You created a very nice tie-in between your teacher feature and math games linky! Just followed on Bloglovin! Thanks! Following :) You have such a cute blog! I follow you on Blog Lovin' and I LOVE this idea! What a fun way to share math ideas!! I love the terrific products linked here. I wish I had more time in the day to look closely at each and every one of them! I love your advice to over plan. This is such a huge key to teaching a successful lesson.